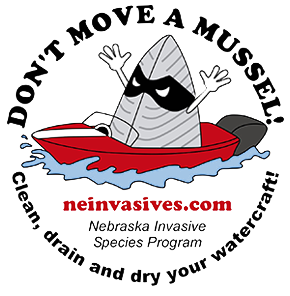 Aquatic invasive species such as Eurasian watermilfoil, Asian clams, and zebra mussels can be spread between water bodies on boating and fishing equipment that has not been cleaned, drained and dried. Help to prevent the transport of nuisance species by following the guidelines below – clean, drain and dry. 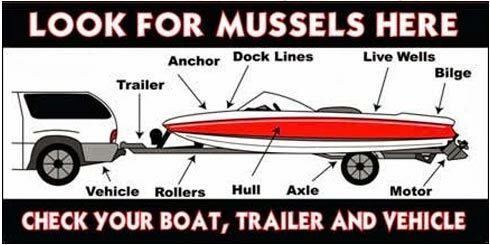 Remove all visible plants, animals, fish, and mud from your boat, trailer, or other equipment and dispose of in a suitable trash container or on dry land. Don’t transport any potential hitchhiker, even back to your home. Remove and leave them at the site you visited. Drain water from bilge, live wells, ballast tanks, and any other locations with water before leaving the launch. Invasive viruses, zooplankton, and juvenile zebra mussels and Asian clams can be transported in even just a drop of water! 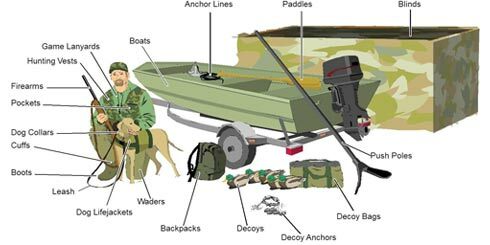 Dry your boat, trailer, and all equipment completely. Drying times vary depending on the weather and the type of material. At least five days drying time is recommended. 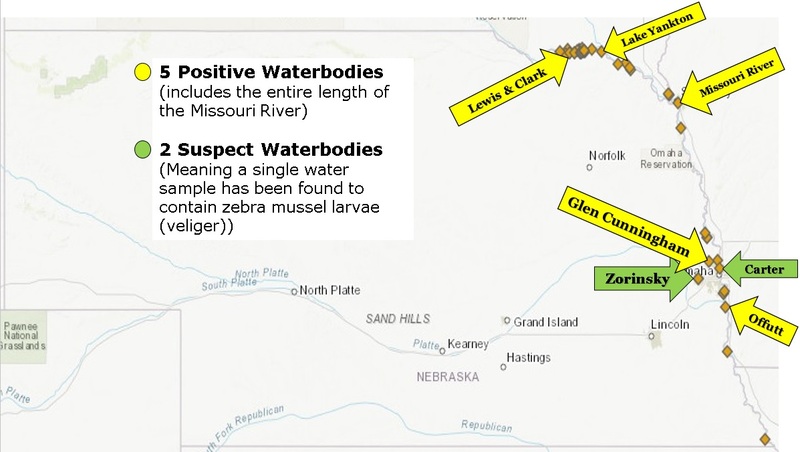 There are 5 waterbodies infested with zebra mussels in Nebraska. Glenn Cunningham Lake in Omaha, NE (2018), Lake Yankton (2017), the Missouri River-the entire length of the river in Nebraska (2016), Lewis and Clark Lake near Yankton, SD (2015), and Offutt Air Force Base Lake in Bellevue, NE (2014). There are 2 suspect waterbodies (which means only a single water sample has been found to contain zebra mussel larvae). These waterbodies include Lake Zorinsky in Omaha, NE (in 2016) and Carter Lake in Omaha, NE (2017). 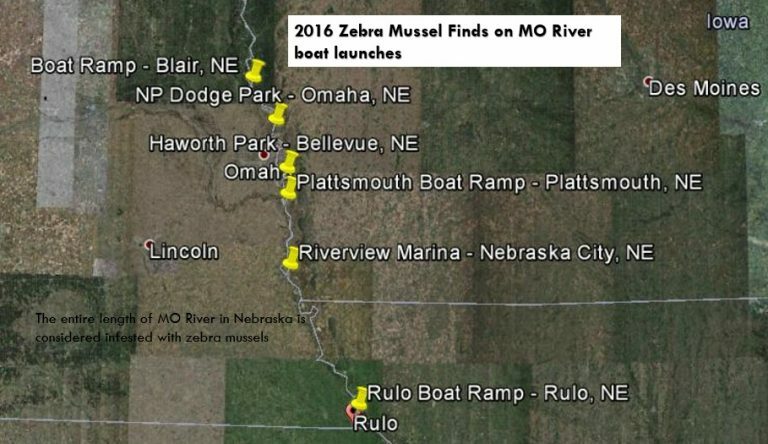 Quagga mussels have not been found in Nebraska to date. 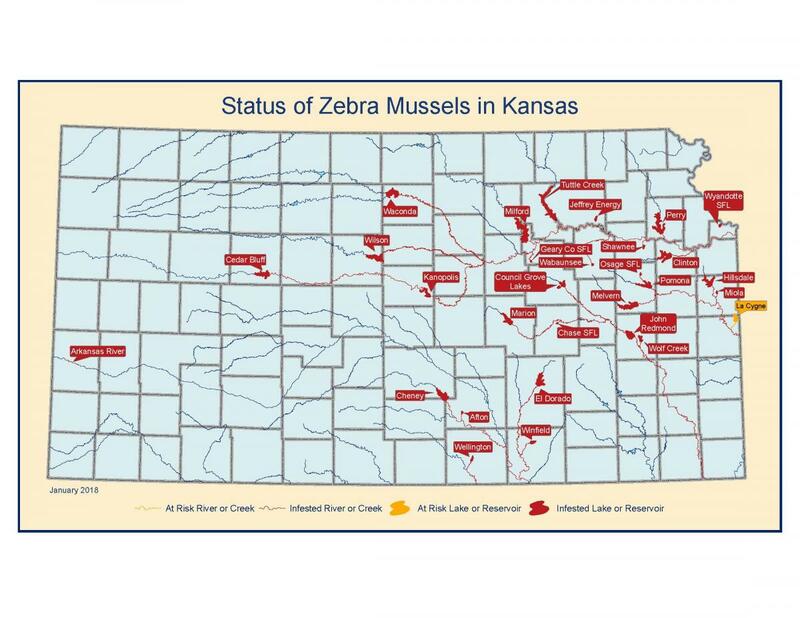 Kansas now has 32 water bodies with zebra mussels. Below is a map from May 2018.